Coverage: Ball-by-ball Test Match Special commentary on BBC Radio 5 live sports extra, online, tablets, mobiles and BBC Sport app. Live text commentary on the BBC Sport website. 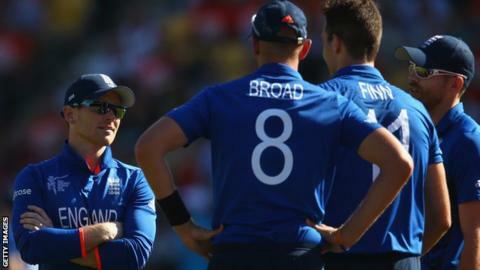 England's performances at the World Cup have hit a new low, says former one-day coach Ashley Giles. England have lost their opening two games in the tournament, with their latest defeat a crushing eight-wicket loss to co-hosts New Zealand. Giles told BBC 5 live Sport: "It's probably never been this bad. It was their biggest defeat ever in a World Cup game." He fears defeat to Scotland in their next game on Monday is not impossible. The former England left-arm spinner, who lost his job as England's limited-overs coach last April and is now head coach of Lancashire, added: "The way they're playing, they're so low on confidence you wouldn't put it past them. "The Scots gave New Zealand a good run in the end. It's a real potential banana skin." England can still qualify for the quarter-finals from Pool A of the World Cup. But after losing to Australia in their opening fixture, Eoin Morgan's side have little margin for error against Scotland in Christchurch on Monday (22:00 GMT on Sunday). Former England spinner Phil Tufnell is also concerned about England's prospects against Scotland, who were beaten by three wickets by New Zealand in their first match. "I didn't think we'd beat New Zealand and Australia, but the manner and the deficit of the defeats was shocking," he said. "Let's just hope they can put it right against Scotland, otherwise we'll never live it down."